We at Lakeside Orthopedic Institute Inc are dedicated to returning people with knee pain to their active lives. We work with you hands-on to restore your quality of life, managing medications and physical therapy, and offering the most advanced minimally invasive surgery. You may be treated non-surgically. However, if medications, changing your activity level, and using walking supports are no longer helpful, you may want to consider partial or total knee replacement surgery. By resurfacing your knee’s damaged and worn surfaces, total knee replacement surgery can relieve your pain, correct your leg deformity and help you resume your normal activities. 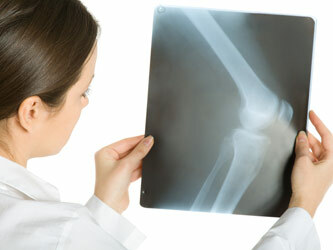 You and your orthopedic surgeon would make a joint decision on whether a knee replacement would best fit your needs. Medications such as warfarin and aspirin will be stopped some days before surgery to reduce the amount of bleeding. Patients may be admitted on the day of surgery if the pre-op work-up is done in the pre-anesthetic clinic or may come into hospital one or more days before surgery. Post operative hospitalization averages one day to a week. This depends on the health status of the patient and the amount of support available outside the hospital setting. The full range of motion is recovered over the first two weeks. At 6 weeks people have usually progressed to full weight bearing with a cane. Complete recovery from the operation involving return to full normal function may take three months and some patients notice a gradual improvement lasting many months longer than that. As an alternative to total knee replacement surgery, Lakeside Orthopedic Institute Inc offers partial knee resurfacing. The surgeon targets the diseased area of the knee without affecting the surrounding normal, healthy cartilage. Through a tiny incision of only 2-3 inches, the diseased part of the knee is removed and replaced with orthopedic implants. The knee is generally divided into three compartments including the medial (inside), lateral (outside), and patellofemoral (joint between kneecap and thighbone). Most patients with sever arthritis have significant wear in two or more compartments. For them, total knee replacement is the best treatment. The rest – about 10 to 30 percent of candidates — have wear confined mostly to one compartment, especially the media. These may be candidates for partial knee replacement. Partial knee replacements have 2-3”incisions compared to 8-9” incisions for total kneww replacements. Other advantages include easier post-op rehabilitation, shorter hospital stays, less blood loss, lower risks of infection, stiffness, and blood clots.